The land should have good perimeter fencing to prevent escape. Other requirements are credible source of food, permit, labor costs and equipment. The breed should be specific to your demography, disease resistant and rugged. The ostrich is closely related to flightless birds like the kiwi, cassowaries and emu. They are the largest living birds and lay the biggest eggs. The birds are widely distributed in the Middle East, East Africa, West Africa and Asia. 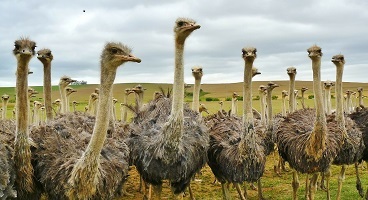 Popular breeds are the red neck, Somali ostrich and North African ostrich. Other are the southern, Masai. You need adequate capital to run the business. Approach a commercial bank for long term, short interest loans. You need collateral, 1/3 of fund requested, an account in the bank and business plan. Make sure you have the required legal documents to run the business. Incorporate the farm as a limited liability company, employer identification number and insurance. If you live in an area with dry climatic condition you would do fine. The birds are well adapted to desert life and open plains. If you are in a cold region you need to provide heaters. Restrict the bird’s movement by building a tall perimeter fence or wall around the property. If you go into hatchery business you need a good incubator for the eggs. Make sure you have the technical proficiency or hire technicians to handle the hatching process. Provide food containers, water though and nutritious food to thrive. Luckily the birds are omnivores and can eat a verity of food. The type of breed you purchase depends on your business template. Purchase the chicks, mature birds to start the business. You have lots of options when farming the birds. You need to determine the type of farming that fits your business template. You could sell their eggs, provide meat, breed them or sell the feathers. It is profitable to focus on the niche that is popular in your area. The economic values of the bird are the products they produce. The main product is the low fat, low calorie meat. The eggs are also popular including cosmetic and pharmaceutical products. Others are feathers for handmade items, high quality ostrich leather. The leather is used to make bags, shoes, belts and sandals. There are three ways to start the farm. You can purchase mature ostriches and breed, chicks or juveniles. Chicks will take about two years to mature while juveniles reduce the growth period. The cost of chicks is infinitely cheaper than juveniles. However the juveniles are a better option to reduce growth period. Purchasing mature birds is costly however they would produce eggs regularly. Make sure the breed is resistant to diseases and has good genetic heritage. The birds are naturally wild and aggressive. You need to domesticate them for proper handling and farming. A good strategy is to handle the chicks frequently to make them used to humans. This will calm the birds and make them manageable as they grow. Create a regular feeding program and make them amiable. The birds are large and require lots of space to move around. They love running and foraging so make sure they have space. They need proper feeding and maintenance to grow. Make sure you erect a perimeter fence that is at least 6 feet high. Make sure you have basic utilities like electric supply, clean drinking water. The birds are omnivores so they eat a variety of food. Common food are grains, grass, mice, rats, insects. They can also eat poultry mash, carrots and broccoli. Other food sources are lizards, ostrich supplements and greens. Make sure you feed the adults in the morning and evening. The chicks are usually feed at least 4 to 5 times a day. Make sure you provide portions they can eat without wasting food. To effectively increase bird productivity use good feed management, correct genetic selection and farm management techniques. It is important for the farmer to provide adequate clean drinking water for the birds. This is because water stimulates good feed utilization, proper conversion, digestion. Weigh the formulated feed to reduce waste or over/under feeding. Feed them twice daily, morning/afternoon and record daily feed frequency. The average feed consumption differs based on the age of the bird. 0-45 day’s old bird requires 25kg, 250 days 250kg. Others are 350 days 400kg while monthly requirements for mature breeders 300kg -500kg. A male ostrich is fully mature in two years while the female mature within eight months. They are seasonal breeders around March to September and mating pair to designated area for better chances of fertility. A single male ostrich is ideal for several female partners. 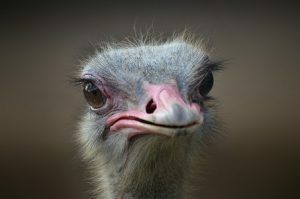 You can use one male and eight female ostriches in your breeding program. 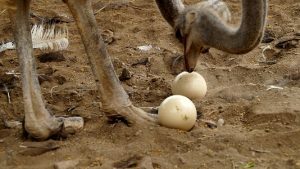 Ostriches lay huge eggs in holes to provide heat. The farmer could allow the natural process or transfer the eggs to a hatchery. The fertilized eggs are then placed in an incubator to hatch. The hatched chicks are kept separate from the adults and provided adequate warmth, nutritious food and later introduced to the adults. Ostrich disease are Salmonella Typhimurium, Campylobacter jejuni and Chlamydia psittaci. Others are Crimean-Congo haemorrhagic fever, Pasteurella multocida, Mycoplasma spp, Newcastle disease virus (NDV). More include avian influenza, Borna disease and coronavirus infections. The business requires lots of patience and time. The birds attract premium price in the open market. You can sell the eggs to supplement your income. The large adults are sold for meat and their plumage. To increase earning the farmer can add poultry farming, pig or goat farming to the business.